The sight and sound of a strap of "sleigh bells" buckled around the middle of a trotting horse is a classic holiday theme. This type of bell strap -- more correctly called a body strap -- has been immortalized in print by Victorian-era lithographers Currier & Ives and in music by traditional holiday songs such as "Jingle Bells". The most common type of body strap is the "New England" style. This strap features one row of bells all of the same size attached to a narrow leather strap. This type of strap appears to have been especially common in the late 1800s and early 1900s. 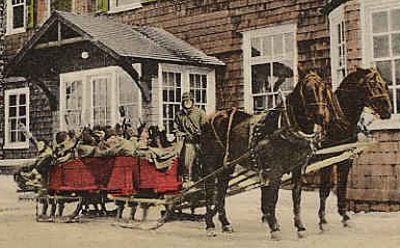 Photo: Festive party in a bobsled pulled by a team wearing New England body straps. Location: Pocono Inn, ca. 1880-1920? Vintage photograph. A variation on the New England style is the all-metal body strap decorated with lightweight machine-stamped bells. Each bell was riveted to a brass base plate, and the plates were connected with metal links. A heavy fabric or thin leather strap was sometimes woven through the links and used to fasten the strap around the horse. The thin brass parts in this type of strap were easily damaged. Today, they have the nickname of "Sunday" straps, because they were supposedly used only on special occasions, such as going to church. Drawing: Advertisement from page 591 of The American Gentleman's Newspaper, January 8, 1881 issue. 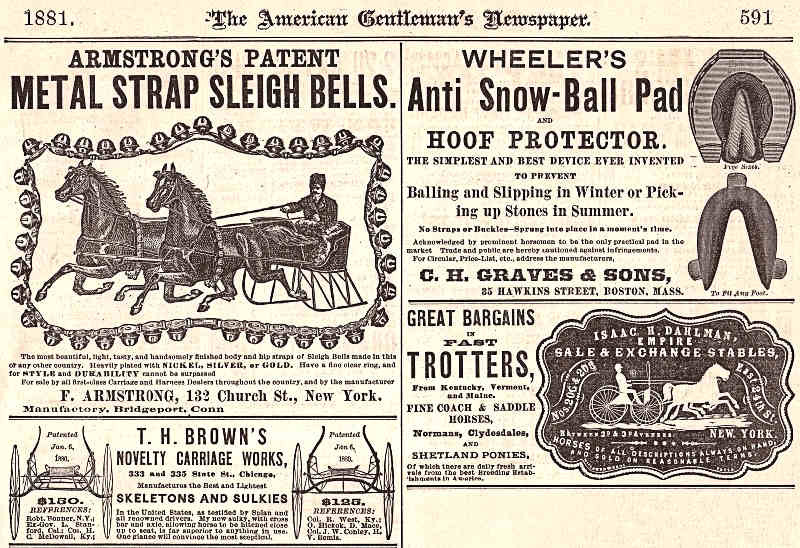 The ad copy reads: "The most beautiful, light, tasty, and handsomely finished body and hip straps of Sleigh Bells made in this or any other country. Heavily plated with NICKEL, SILVER, or GOLD. Have a fine clear ring, and for STYLE and DURABILITY cannot be surpassed. For sale by all first-class Carriage and Harness Dealers throught the country, and by the manufacturer." Click on the image to see the entire ad. Almost as common as the New England strap is the graduated body strap. This style has a large bell in the middle of the strap with smaller bells symmetrically arranged in decreasing size on either side. 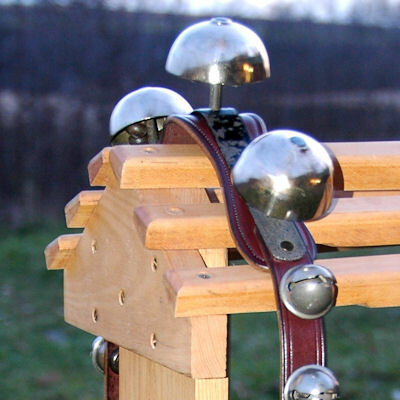 The size and number of bells on graduated straps varies widely depending on the whim of the original maker and customer -- there were no rules about what bells were to be used on a body strap. 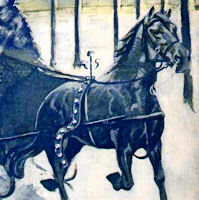 A short, separate strap sometimes called a "keeper strap" is needed to secure the bell strap to the horse's harness. Otherwise the weight of the biggest bell will gradually pull it underneath the horse's belly (see photo). The keeper strap also prevented the bell strap from bouncing away from its safe place on the middle of the horse's back. Photo: Graduated bell strap. The biggest bell happens to be hanging underneath this horse -- either this was the owner's choice or he lost the small "keeper" strap that holds the big bell on top of the horse's back. Photo by Bill Simcox. Ca. 1950-1960? An unusual style of body strap is the "pony" strap with two or more rows of small, closely-spaced bells. A pony strap can be used on horses of any size -- "pony" in this case refers to the small size of the bell, not to the size of the horse. Photo: Old pony bell strap with two rows of small bells. Another unusual style of body strap is the type that has a row of open-mouth (liberty) bells dangling underneath the belly of the horse. 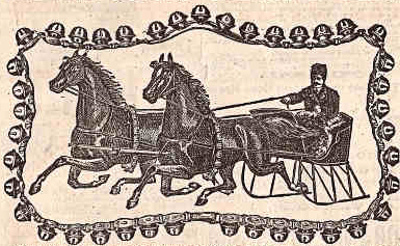 The part of the strap that goes over the horse's back can be plain leather, or it can have a row of crotals (sleigh bells) mounted on it, much like a New England strap. A few manufacturers combined a body strap and a saddle chime into one product. This combination design appears to have been marketed in the late 1800s or early 1900s. Few have survived in good condition; they appear to have been fairly fragile. The section of the strap meant to lie on top of the horse is made of sheet metal. The metal bracket is usually covered on the horse side with a layer protective leather or felt and the outer side is sometimes covered with leather. One to three chimes are attached to this metal bracket. A leather strap extends from either side of the bracket. The strap is decorated with small bells, just like a New England style strap. Left: Restored strap that has a center bracket fitted with three chimes. Right: A trotter wearing a similar combination strap. 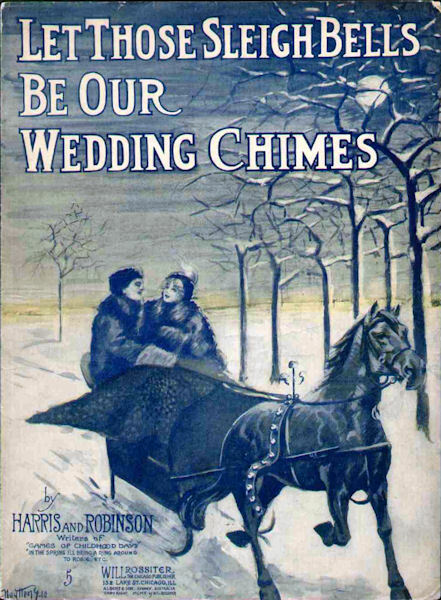 This image is from the sheet music cover of "Let Those Sleigh Bells be Our Wedding Chimes" by Harris and Robinson, copyright 1915. Click on the image to see the entire cover. Body straps are constructed two basic ways -- unlined or lined. An unlined strap is made of a single strap of leather, like a trouser belt with bells. A lined body strap has a protective layer of leather underneath the bells. The bell strap and its lining are held together with small rivets, with small separate "keeper loops", or with stitching or lacing. See our Custom Projects for examples of these construction methods. Draft horse or warmblood: 8 to 10 ft.
Cob to standard horse: 7 to 9 ft.
Mini to pony: 4 to 7 ft.
For single-horse use, add another foot of length so the strap will be long enough to run outside the shafts. 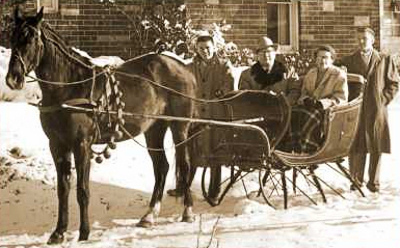 Photo: Single horse hitched to a sleigh. The bell strap is outside the shafts and traces. Note the gap between the horse's belly and the bell strap -- this is about right. Vintage photograph. Terry Keegan, Douglas Hughes, Claude A. Brock, Ran Hawthorne. Horse Bells. National Horse Brass Society, Surrey, England. 2nd ed. 1988.